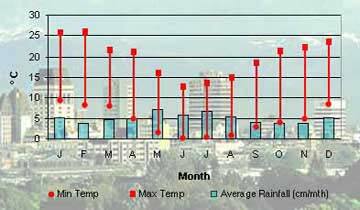 The chart below shows the yearly temperatures and rainfall in Christchurch, New Zealand. Temperatures are in degrees Celsius and rainfall in centimetres. They are indicative (within a few degrees) of weather you can expect throughout Canterbury region. No guarantees though! We have a pleasant mild climate,accommodating both summer and winter activities.